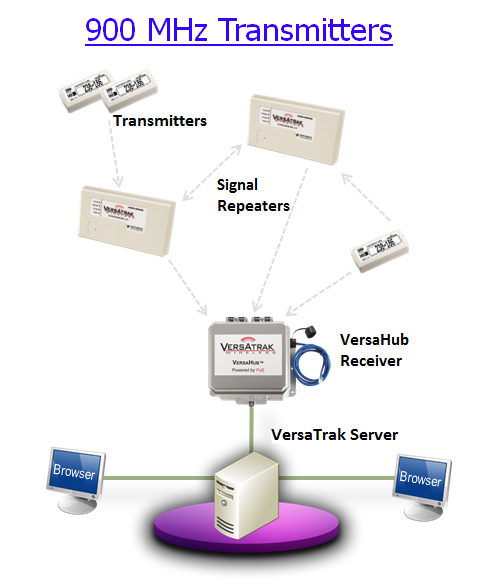 900 MHz – Veracity Group Inc.
A VersaTrak 900 MHz system consists of transmitters, signal repeaters (power boosting) and a network attached VersaHub (receiver and data buffer) to send the wireless data to the server. Using 900 MHz technology to collect your temperatures and other critical data has some advantages over Wi-Fi. One of the major benefits of a 900 MHz system is that it is self contained and does not require a lot of involvement from IT to grow. It also does not rely on the WI-Fi system always being up and running to function.